Our Grand Prize Winner, drawn on May 28, 2016, was Ishbel Arnold, from Meota, Saskatchewan. 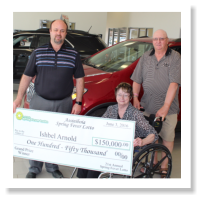 Ishbel chose to receive $150,000 CASH as her Grand Prize! Ishbel came to Assiniboia for our Winner’s Dinner, and met our executive members. She is shown with Lotto Chairman, Curtis Nelson, receiving her Grand Prize cheque at Lotto Headquarters! Congratulations Ishbel! Congratulations to our 50/50 Winner Ashley Carruthers, of Biggar, Saskatchewan. Ashley is the lady with the HUGE smile, being presented with her Prize Winning Cheque by Lotto Chairman, Curtis Nelson. Ashley won $60,800.00! Ashley is getting married this summer so the funds she has won will go to good use! The Winner of our 50/50 draw received one half of the proceeds of all tickets sold in the 50/50 draw. Our 2nd Prize Winner, drawn on May 28, 2016, was James Moser, from Regina, Saskatchewan. 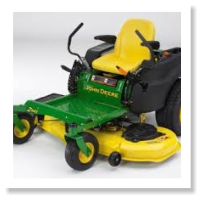 James chose to receive a 2015 John Deere Z445 Zero Turn Mower as his Prize. Malcolm Burns, from Niton Junction, Alberta won $3,000.00 as his 3rd Prize choice. 4th prize was won by Jeff & Grace Lees, from Arcola, Saskatchewan, and again our winners selected Cash as their Prize, $2,000.00! 5th Prize was won by a local Assiniboia resident, Conn Yorga, from Assiniboia, Saskatchewan. Conn chose a Cash Prize of $2,000.00. On Saturday, March 5, 2016, we held our Previous Buyer’s Draw. Congratulations to Clair Paul from Preeceville, Saskatchewan, our Previous Buyer’s Draw Winner! Claire had a choice of going on a 7 day Alaskan Cruise for 2, or receiving $5,000.00! He chose Cash as his Prize. Clair is shown here with his Prize Cheque! On Saturday, April 9th, 2016 we had our Early Bird Draw. The Winner, Douglas Blackhurst, from Regina, Saskatchewan, had a choice of winning a 7 day Alaskan Cruise for 2 or $5,000.00! Doug chose the $5,000 Cash Prize. 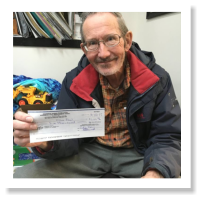 Congratulations Doug, and thank you so much for being such a long time lotto supporter. Drawn on May 28, 2016, these Winners had a choice of receiving $100.00 Cash as their Prize or a John Deere, Case or New Holland Remote Control Tractor, or a Kubota Wet/Dry Vacuum or an Apple TV! On Saturday, March 26, 2016, thirty very Lucky, Very Early Buyer Draw Winners were drawn. The Winners had a choice of one of 4 Prizes, One Spring Fever Lotto Ticket, 2 ten Packs of 50/50 Tickets, a Bullseye Countertop Popcorn machine, or a Stanley Jump Starter with Air Compressor. Congratulations to all of the Winners!